Waverley’s Clyde season ended on the traditional Cowal Games weekend, the last weekend in August. After some mechanical work the paddler headed for Liverpool for two days of sailings. On the first day 1 September her departure from the Mersey was delayed by a shipping movement but it was finally possible for her to berth at the rebuilt Llandudno Pier before heading further west to the Anglesey coast. Conditions had deteriorated by the second day and it was not possible to get alongside at all at Llandudno, so all the Liverpool passengers enjoyed the full cruise. The weather was, however, kind enough to let the steamer’s positioning voyage to the Bristol Channel to go ahead without delay and Waverley was able to offer her morning cruise under the Severn Bridges and her afternoon sail round the Holm islands as planned. The gremlins intervened and the paddler retired to Avonmouth Docks for further mechanical attention. Unfortunately this meant that the planned evening cruise on Friday and the entire cruise on Saturday had to be cancelled. But the repairs were just completed in time for Sunday’s trip from Clevedon and Penarth to Ilfracombe and Lundy Island to go ahead. The steamer then sailed light through the night to give a short charter out of Milford Haven before heading round Lands End to Weymouth to position for her South Coast season. Once again the strong winds, which had been a feature of the entire season, returned again and the first scheduled cruise out of Weymouth on Wednesday 9 September had to be cancelled. Thursday’s cruise went ahead with some amendments. Saturday saw another enforced cancellation. A short break in the weather led to Sunday’s sail from Southampton to Yarmouth, Bournemouth, Swanage and Weymouth running. At return time, the wind had increased and it was decided the second call at Bournemouth would not be possible and passengers were either given their train fare or coached back from Swanage. The next trip we did was the Thursday cruise from Portsmouth to Yarmouth, Bournemouth, Swanage and along the Jurassic coast to turn off Lulworth Cove. There was a coach connection from Worthing but the coaches were delayed by heavy traffic and the steamer departed 50 minutes late. This meant there would be insufficient water at the return time from Bournemouth so coaches had to be laid on again from Swanage, limiting the number that could be taken. Friday’s cruise to The Needles from Southampton, Portsmouth and Yarmouth went ahead in good weather with good numbers as did Saturday’s Round the Island trip. Sunday dawned rather foggy – in fact, it was not possible to see across the River Test. There were also technical problems and these were not resolved until 50 minutes after sailing time. Revised times were quickly worked out but the need to reach Bournemouth at a workable state of the tide and get back to Class IV waters in time meant that the Weymouth call had to be dropped with a coastal cruise to Durdle Door being substituted. Then strong winds returned and the cruise on 15 September was cancelled. On the Wednesday a shortened cruise was offered from Swanage and Yarmouth to tour Portsmouth Harbour but after the second Yarmouth call, the paddler returned to Southampton and her remaining passengers were coached home. The Thursday cruise was also curtailed. From Portsmouth the steamer proceeded to Yarmouth as planned but then headed back east through The Solent and round Bembridge Ledge, turning back between Sandown and Shanklin. On the return to Portsmouth, water was taken preparatory to the positioning voyage to the Thames. Waverley arrived off Margate in good time but there was a paperwork problem which prevented the planned call going ahead. The intending passengers were coached to join the steamer at Whitstable. The remainder of the trip to Southend and Gravesend, turning in the Pool of London, was operated as planned. After disembarking her passengers and taking bunkers, the paddler gave a one-way upriver cruise to Tower Pier where she spent the night. Next morning’s departure for Southend direct was all but full. This trip is notable as it carries one-way coach parties almost exclusively. Indeed, only 6 passengers stayed on the ship for her round trip to Gravesend, again turning in London, which was fully booked. After disembarking her passengers at Southend, the paddler anchored nearby for the night. She had an early start on the Sunday, arriving at Harwich Ha’penny Pier just after 10 a.m. The day’s cruise took the steamer one-way to Clacton and Tower Pier. 15 coaches were needed to take everybody home, including those who started their journeys by coach from Ipswich! Captain O’Brian was relieved by Captain Steve Colledge on Monday which was an off-service day at Gravesend, although a private evening charter was run from Tower Pier in the evening. Tuesday should have taken the paddler from Gravesend and Southend to Clacton. However, a strong easterly wind prevented the sailing to Clacton going ahead. Therefore Captain Colledge arranged a trip around the Forts in lieu, including a rare visit to the Knock John Fort. Having dropped off the passengers at Southend Pier, the steamer anchored in Southend Roads for the night. On Wednesday the Southwold passengers (who had been due to be coached to Clacton) and the Clacton passengers were all coached to join the Waverley at Southend. The steamer then took everyone up river to Tower Pier, where she spent the night. The Thames Forts were the intended destination on the Thursday. The steamer left Tower Pier as scheduled at 10.00 for Gravesend and Southend for the non-landing cruise. Numbers were very good for a mid-week sail and the weather was excellent. Good views were had of the Red Sands and Shivering Sands Forts and a distant view of Knock John Fort. An evening cruise was also offered from Gravesend to The Tower and back with Waverley remaining there overnight. Friday’s cruise was upriver from Southend and Gravesend to turn in the Pool of London during the day followed by a one-way evening cruise from Southend, with coach return. Again the weather was excellent and good numbers were carried. Waverley spent the night at Tower Pier so as to ready for her Saturday trip to Southend and Whitstable for time ashore. The day was very misty with limited visibility persisting all day. Nevertheless, numbers on board were very good with plenty of passenger turnover. A lot of people went one-way to Southend which meant there was space to take others from Whitstable to Tower Pier. Fortunately the mist did not re-appear overnight and glorious blue skies accompanied Sunday’s sail to Gravesend, Southend and Clacton as Captain O’Brian resumed command. This was a relatively quiet sailing as the distant destination of Clacton makes for an early start and late finish, not an ideal combination for a Sunday. Unusually, the paddler was berthed port side to at Clacton. Monday was spent off service at Gravesend. The weather forecast at the weekend suggested that strong winds would again put pay to Waverley’s mid-week round trip to the exposed Essex coast. Fortunately this did not turn out to be the case. So the paddler steamed off as planned on Tuesday to Southend and Clacton for a cruise to the River Blackwater, with a coach return for Gravesend and Southend. Difficulties berthing at Clacton unfortunately reduced the cruise as passengers had to be returned in time for their coaches. The steamer then positioned to Harwich where she spent the night. Wednesday’s sail took her to Tower Pier, calling at Clacton for more passengers, with Great Yarmouth passengers being coached to Harwich. The annual PSPS London Branch charter took place with about 300 on board. As Thursday was again off service at Gravesend, Waverley returned there light ship. The boiler gremlins were at work again on Friday 9 October when an electrical fault delayed steam raising. The Margate call had already been replaced by a coach connection to Whitstable, which has a short tidal window for Waverley calls. By the time repairs had been effected it was too late for the steamer to reach Whitstable in time. Efforts to find coaches from Whitstable were unsuccessful so the trip had to cancelled, although some people made their own way to Gravesend by train. The Margate coaches took their loads straight home. However, the paddler was able to make her Southend call as planned prior to steaming up the Thames, calling at Gravesend. A non-landing round trip was then made through Tower Bridge turning in the Upper Pool of London. Finally, the steamer made a public positioning trip back to Tower Pier, ready for the next day’s sailing. Saturday’s cruise took Waverley back to the Thames Forts calling at Gravesend and Southend. Regular Purser Ian O’Brian was on leave for the weekend (watching football in Portugal) and his duties were carried out by Helen Ellis from the Glasgow office. Sunday saw Waverley’s final Thames cruise for 2015 and this took her from Tower Pier to Gravesend and Southend for a River Medway cruise. It was a fair day which brought out a reasonable crowd. While we were alongside Southend Pier we heard the distant roar of the Avro Vulcan jet bomber making one of her farewell flights around Britain. The steamer picked up the Medway pilot off Sheerness before proceeding past the Thamesport container berths and turning back downstream. The preserved diesel tug Touchstone had come out to meet the Waverley as in 2014 and commentator Roddy McKee called for three cheers for her crew, some of whom were former Kingswear Castle volunteers. After dropping the Medway pilot, the steamer passed close to the wreck of the liberty ship Richard Montgomery before zig-zagging around the Estuary before berthing back at Southend Pier for the 2015 last call. An evening round trip was offered from here with coach return from Tower Pier. Then on to Gravesend where an evening circle cruise was given. The steamer passed through Tower Bridge in the darkness before berthing to discharge most of her passengers. Only about 50 remained on board for the final leg back to Gravesend. Waverley took bunkers in the morning before departing Gravesend for Southampton where fuel was again taken the following morning. She then sailed direct to Glasgow arriving in the early hours of Thursday 15 October. Early risers on Saturday 17 October 2015 enjoyed clear skies and were looking forward to a lovely day’s sail on the paddler. However, in the hour before departure thick fog rolled in limiting visibility to about 100 metres. Given it was low tide, navigating the steamer would have been tricky in good visibility but out of the question in thick fog. Captain O’Brian announced a delay in departure, although he decided to turn the vessel straight away to avoid having to turn later against the flood tide. Those PSPS members who had attended the previous evening’s excellent talk on “Handling the Waverley” by David Howie now had some appreciation of the difficulties of navigating the steamer in good conditions, let alone in poor visibility. Visibility came and went for the next hour and a half before a sustained improvement was observed. Waverley’s RIB was sent downstream to assess whether the improvement was general or localised. Then Stand By was rung on the Engine Room telegraph about 12.05 (scheduled departure had been 10.00). The steamer proceeded sedately downstream past ghostly half obscured riverside buildings then around Clydebank speed had to be further reduced through a thicker patch of fog. From Dumbuck onwards things started to return to normal with the sun piercing through. Despite the extended delay, large crowds were waiting to board at both Greenock and Helensburgh. On we steamed in the sunshine to smaller pick-ups at Kilcreggan and Blairmore. A three hour cruise up Loch Long and Loch Goil had been scheduled but the need to get back to Glasgow in time for the evening cruise meant the afternoon trip had to be curtailed to about 90 minutes. However, we were still treated to the sight of Carrick Castle! Arrival back at Pacific Quay was just before the 19.30 scheduled departure of the evening cruise which took a load of about 400 on a non-landing trip. Sunday also dawned bright and sunny but fortunately there was no repetition of the previous day’s fog. A slightly longer trip was offered to Greenock, Largs, Rothesay and Tighnabruaich for 30 minutes ashore. The first leg was relatively quiet but large numbers joined at Greenock and Largs meaning over 700 were on board for the hop to Rothesay. While heading north up the Kyles of Bute, we passed MV Loch Riddon heading from her station at Tobermory to Ardmaleish for her refit. She had spent the previous two nights at Oban and Campbeltown. On the return voyage we saw her berthed inside Rothesay Pier. About 25 minutes were allowed at Tighnabruaich which was enough time to view the Pier Association’s displays and take a picture or two. Suzi’s Tearoom had to wait for next year! The return voyage was punctuated by rounds of applause to show our appreciation for each pier’s staff’s efforts throughout the season and the traditional long whistle blast on departure. The large numbers joining and leaving the steamer made her 50 minutes late at one stage but this had been clawed back a little by Greenock. After an exceptionally boisterous series of whistle blasts, the paddler accelerated to a spectacular 58 rpm! Although this speed could not be sustained for long in the river channel, it contributed to a 15 minute reduction in lateness. One of the other traditions of the last day of the season is the creation of weird and wonderful destination displays. Today was no exception with three different displays appearing, the final one marking the Farewell Cruise of Captain A. O’Brian. After our arrival back at Pacific Quay, PSPS Chairman Iain Dewar made a presentation in Waverley’s Jeanie Deans lounge to Captain Andy O’Brian who was leaving command of Waverley to become a Clyde pilot. 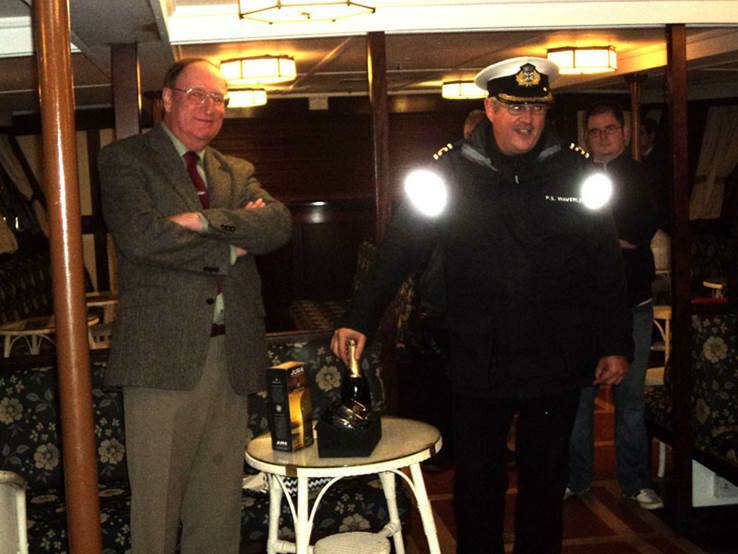 The presentation was on behalf of the PSPS Council, funded through individual contributions, and consisted of two specially engraved Waverley whisky glasses, reading 'Captain Andy O’Brian / 10 Years at the Helm / Best Wishes from PSPS Council’, a bottle of 10 year old Isle of Jura whisky and a bottle of Champagne. This is not only the end of the season but the end of an era. It was 10 years ago that a rash young (ish) officer allowed himself to be persuaded to join Waverley Excursions. Shortly afterwards, with the resignation in quick succession of two captains, he found himself Senior Master. That is no small undertaking. Driving this ship with her unique handling characteristics — especially when going astern — is not for wimps. As any master finds, there is however always a source of plentiful advice — on the promenade deck. Fortunately for the ship, Captain O'Brian took his own counsel and became an excellent handler of Waverley. But that of course is not all that is involved in being Senior Master. It is more than a full-time job, extending right through the year, doing everything that would be done by shore staff in a normal company. Everything from arranging bunkers, planning timetables, securing pilots, chatting up tug and pier staff to secure favours, through to, I am assured, procuring uniforms for female staff. And to save pilotage money, on one famous occasion he even managed to find a cost-free helicopter to lift him off the ship. I could go on, but Captain O'Brian is owed much more than anyone can know for sticking with it for 10 years: he has been unbelievably loyal, doing a job few would want or have the ability to do. So we wish him well in his new job as a Clyde pilot, knowing he'll be back to help whenever he can. For some pictures taken during the season, please visit my Flickr site.